Today I’m sharing sketchnotes of an interview from The Story Podcast with guest Todd Henry. 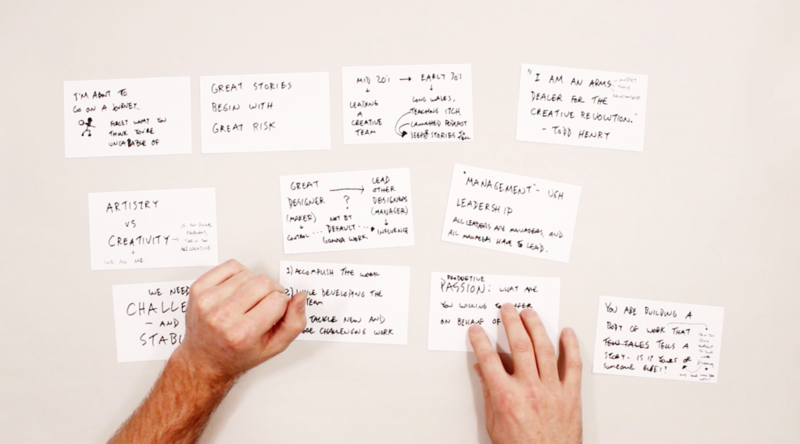 For this one I’ve decided to start by using index cards to capture the most interesting ideas. 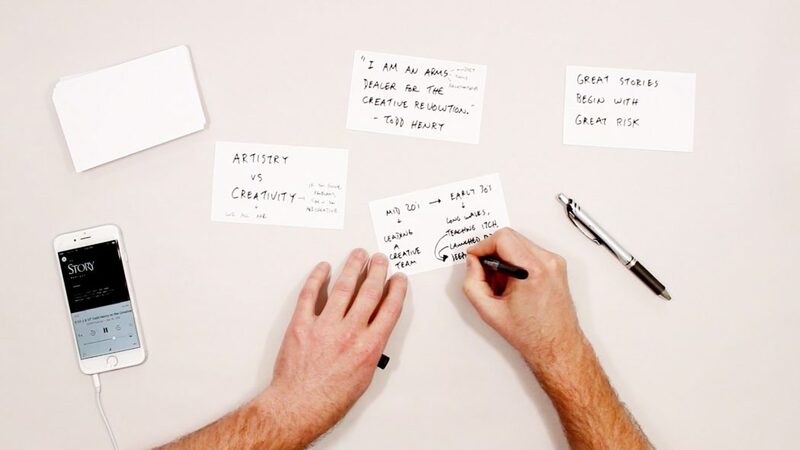 That way, at the end of the conversation I can look for an overarching model or story to incorporate into the one-page summary that I’ll create on the paper beneath those index cards. This is an example of two-stage sketchnoting – you have one approach on the first pass through a set of ideas, and then another approach on the second pass through when you complete your notes. For me this can be useful when I want to keep open the option of connecting something that happens in the first five minutes with something that happens in the last five minutes. That’s harder to do when you’re filling up the page in the moment, while the conversation is happening. 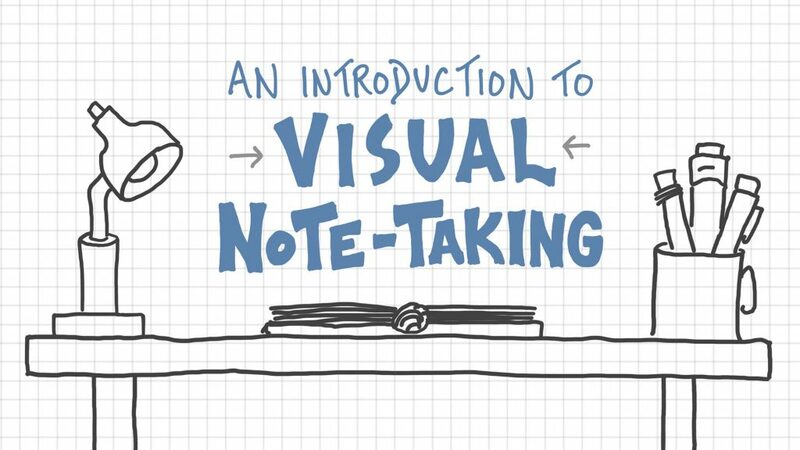 The downside of this approach is that it probably does take a bit more time compared to one-stage real-time sketchnoting. But for me the flexibility makes it worth to use this two-stage approach, at least some of the time. 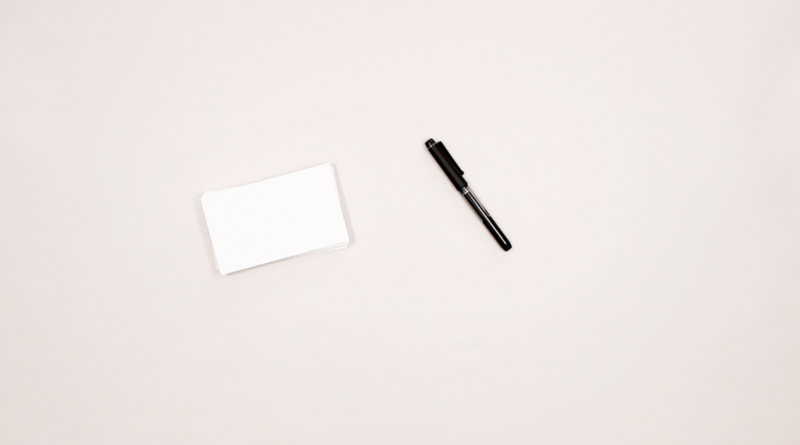 And what’s nice about index cards is that they’re easy to move around. So once you’ve listened to an entire podcast and have a bunch of interesting ideas on each card, you get to play around with how you might organize those ideas on the page and think about what visual elements you might use to help them stand out. This podcast is about stories and storytelling, and most stories begin with someone choosing to go on a journey, and what that requires, according to Todd Henry is forgetting what you fear you’re incapable of so that you can embrace what you might be capable of becoming. In this episode Todd share’s a bit of his story: leading a creative team in his mid 20s, then feeling the itch to teach in his early 30’s and his decision to start a podcast as an avenue for teaching and for exploring the deeper stories that he thought were worth telling. 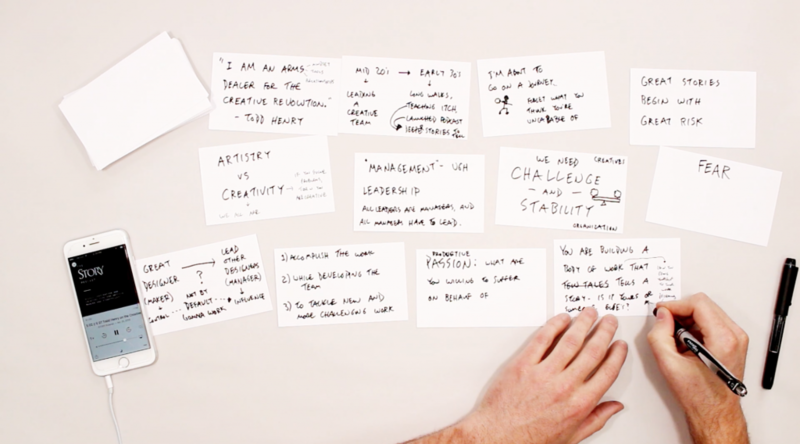 Now he considers himself an arms dealer for the creative revolution, equipping people with the mindset, tools, and relationships to thrive in today’s create-on-demand world. And as a long-time follower of his work, I think he is succeeding in that mission. One of the dynamics that they explored in this conversation was the balance needed between challenge and stability, how those engaged in creative work need both in order to thrive, and too much of one or the other creates an imbalance that won’t bring out the best work. They also talked about the differences between and the transition from a maker to a manager, and how makers do everything they can to control the circumstances and processes surrounding their work, and how managers can’t do that but instead must focus on the influence they have on team doing good work. Good ones do three things, according to Henry: 1) they accomplish the work, 2) while developing the team, 3) to tackle new and more challenging work. And then what might have been the most powerful and lasting message from the conversation – the idea that you are building a body of work that tells a story. The question, though is this: is that story yours or someone else’s. Are you being true to your own vision for the work, or are you letting others define what it should be and what it should look like. That is just a handful of the ideas that came up during this podcast episode. I encourage you to listen to the full thing so that you can get the full context behind these ideas and many others. As I think about how these ideas impact my work, I recognize that I have a lot of control over the challenge vs stability balancing act, and I think part of what I’m still trying to figure out is how best to build both into the routines that I create for myself. Right now I’m leaning on the stability of a newly simplified approach to the videos that I’m making (which I’ll explain in more depth soon), while also challenging myself to tell good stories and create engaging videos within the simplified constraints that I’ve set up for myself. And since I don’t manage a team of creatives, that transition from maker to manager isn’t super applicable to me, but there are some parallels I think to the transition from a maker to a teacher (which is what I consider myself to be) and how in that case my job as a teacher isn’t to control the people that I teach but instead to equip those I teach with the tools to do good work. I think that’s also what Todd Henry is doing as an arms dealer for the creative revolution. When it comes to the body of work that I’m building, to be honest I don’t yet know what story it will tell, but I think that I am getting closer and closer to telling each chapter of that story in a way that’s true to me. It’s by focusing on each chapter, each paragraph, each sentence, and each word that I’m able to slowly uncover the story that maybe has been there all along. For today, though, I’m pretty happy with this small piece of that ongoing story, and the way in which starting with rough notes on cheap index cards got the momentum going. So know that that is one option for you too the next time you sit down to listen to ideas and capture those that resonate. I hope that you enjoyed the ideas that I chose to highlight from this episode of the Story Podcast. I’ll be back again soon with more ideas worth visualizing.